For more than a century the people of London have crossed the River Thames through foot tunnels at Greenwich and Woolwich which owe their existence to that great Victorian working class hero Will Crooks. The Woolwich MP’s vision was of a free passage under the Thames for people commuting to work in the docks and factories on the north bank of the river. The docks have gone, but the tunnels, classed as public highways and therefore kept open around the 24 hours a day, are now used in large part by those working in the financial services sector in Canary Wharf, and by tourists wishing to sample the baroque majesty of maritime Greenwich. The tunnel at Greenwich is also part of National Cycle Route #1, which links Dover and Inverness. Taken together, the Greenwich and Woolwich Foot Tunnels are used by 1.5 million people every year. Whether this be for work or leisure, the tunnels are a vital transport and cultural asset which, in the spirit of their creator, belong to the people of London. Management of the Greenwich and Woolwich Foot Tunnels is the responsibility of the Royal Borough of Greenwich. For some years the tunnels have been in a poor state of repair, and for this reason they have been the subject of a renovation project funded by an £11.5m grant from central government. Beset by delays, contractual issues and political obfuscation, the tunnel renovation work is far from complete. In 2011 the original contractors were sacked without explanation, and the Royal Borough of Greenwich has yet to release the report of an independent inquiry into what went wrong. The new lifts at Greenwich are subject to frequent breakdown, work on the staircases has halted, and new lifts have yet to be installed at Woolwich. The matter is now in the hands of auditors at the Greater London Authority, and few expect the work to be finished before the end of next year. Local people have had enough of the mismanagement of this invaluable community asset. We are now rallying together in celebration and defence of the tunnels, and in early September will formally launch the Friends of Greenwich and Woolwich Foot Tunnels. The aim of this new community group is to promote the use and enjoyment of the Greenwich and Woolwich Foot Tunnels, and to oversee and hold to account those responsible for them. Together we will work to ensure a high standard of maintenance, appearance and access to the tunnels, represent all tunnel users – pedestrians and cyclists together – and, with the rapid economic growth of the Isle of Dogs and Newham, lobby for the importance of the tunnels as a transport facility. 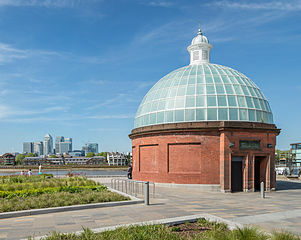 The inaugural meeting of the Friends of Greenwich and Woolwich Foot Tunnels will take place on Thursday 5 September at the 10 Centre, Tarves Way, London SE10 9JU, starting at 7pm. The venue is located behind Greenwich DLR station, at the end of Straightsmouth. All are welcome, and we look forward to seeing you there.